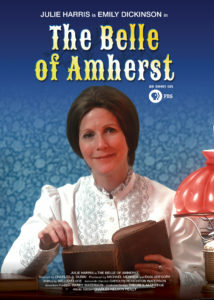 Julie Harris is in her glory as Emily Dickinson and her performance celebrates Dickinson’s life, spirit and poetry. This 1976 PBS teleplay production was filmed before a live audience in Los Angeles, which adds to the theatrical flavor of the performance. Harris is in her glory as Emily Dickinson and her performance celebrates Dickinson’s life, spirit and poetry through subtle body movements, vocal inflections and facial expressions, all enabling Harris to resurrect the renowned 19th century poet. So powerful is her performance that, despite the fact she is the only person on the stage, in the scenes when she ‘speaks’ to family members, it’s easy to believe that she is sharing the stage with others. Dickinson was outspoken for the era and a true eccentric, understanding her place in Amherst (“People in a small town need their local characters, that’s what I am”), having issues with the church (“The only sermon I ever liked was the one on disbelief”) and lived her life as a virtual hermit, pining after unattainable men. Yet she was witty and drew enormous satisfaction from her poetry. Dickinson went to her grave never having married and while she penned some 1700 poems (only seven were published in her lifetime and those were published anonymously), she never gained the recognition she deserved while she was alive. The play skillfully weaves the letters and poetry found in her room after she passed, into the body of the script. She lived the entirety of her life (1830 to 1886) in the small town of Amherst, Massachusetts. Julie Harris won the 1977 Tony Award for Actress in a Drama and recreated her stage role in the filmed production. 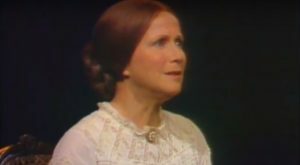 The original Broadway production of ‘The Belle of Amherst’ by William Luce opened at the Longacre Theater in New York on April 28, 1976 and ran for 116 performances.